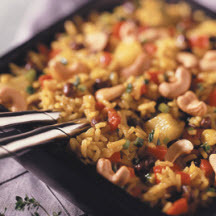 This zesty flavored rice dish combines cooked rice with black beans, red pepper, onions and pineapple. Lime juice and curry get your attention and add that great island taste. Heat oil in medium skillet. Cook and stir bell pepper and onions 2 to 3 minutes. Add curry powder; stir 30 seconds. Combine cooked rice, Equal®, lime juice and salt in medium-size bowl. Stir in cooked vegetable mixture, pineapple and black beans. Rice may be served warm or at room temperature. Sprinkle with cashews just before serving. Nutritional Information Per Serving (1/8 of recipe): calories 196, protein 6 g, carbohydrate 31 g, fat 3 g, cholesterol 0 mg, sodium 474 mg.
Food Exchanges: 1 1/2 starch, 1/2 fruit, 1 fat. Recipe and photograph provided courtesy of Merisant Corporation ® and the NutraSweet Company, makers of Equal®. Information on the artificial sweetener Aspartame.